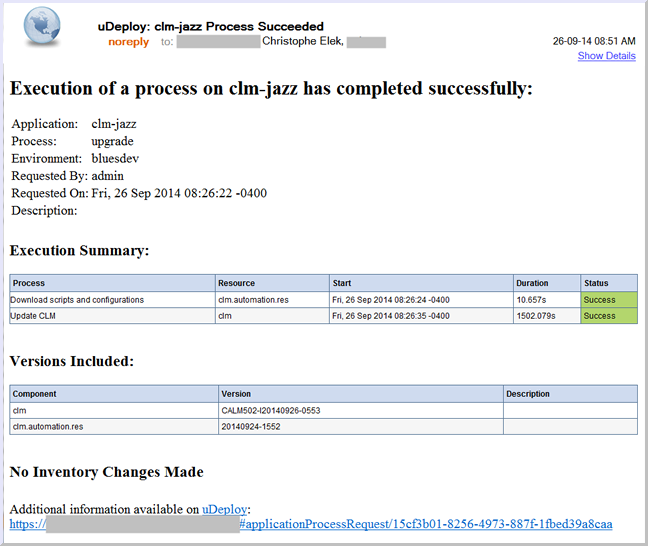 On September 26, the Jazz team reached another milestone in our quest to continuous deployment of IBM Collaborative Lifecycle Management (CLM) to production on Jazz.net. The team managed a complete move from continuous integration to end-to-end continuous deployment. This included building, testing and deploying a CLM build, without human intervention. With such a milestone, the CLM team can fulfill the promises of the DevOps paradigm, which is to release faster and reduce risk. The automated deployment and testing now takes 25 minutes instead of 1 hour manually. And, because the team now deploys daily, this means saving 15 days of work! A developer checks in code in Rational Team Concert in the Integration Stream. A new version of the CLM component is pushed to IBM UrbanCode Deploy. The build is installed on a test system. Tests are run against the test system. Status of the test is set in IBM UrbanCode Deploy on the version. The same build script upgrades staging through IBM UrbanCode Deploy. And, here’s how we set up the IBM UrbanCode Deploy Server to achieve full automated deployment. Note: The ANT scripts below are given as partial examples and will not work as-is in any environment. After the Build is done, we push the version, the clmBuildLabel, to IBM UrbanCode Deploy Server using the following ANT target. After the Test pass, we set up the status value of the test to the version using the following ANT target. Finally, we removed any gate on the IBM UrbanCode Deploy Server, and used the following code to push for the deployment of the version. This target calls the REST API of IBM UrbanCode Deploy. In the next steps, we will run the set of tests against the staging environment, and then we will plan continuous delivery and deployment to the production system. Once the entire pipeline works perfectly on staging, the team will plan continuous delivery and deployment to the production system. Christophe, this is awesome! Fantastic achievement, I must say. 1. Are the ANT targets you shared simply setting up the parameters for the subsequent REST API call, or is the API call itself in there too? I don’t completely understand where these ANT targets live and how they are used. 2. You say, “we removed any gate on the IBM UrbanCode Deploy Server, and used the following code to push for the deployment of the version.” Do you simply mean that you are able to pass through the gate because of a passing test result? Not sure why you would “remove” the gate.